Air pollution is spiraling out of control across the country with serious public health consequences. Delhi is fighting a tough air pollution battle and last year almost 200 days were rated to be ‘poor’ or ‘severe’ air quality. While graded responses have been developed by the government to control pollution peak, urgent implementation of a comprehensive and time-bound action plan is needed to sustain the gains. 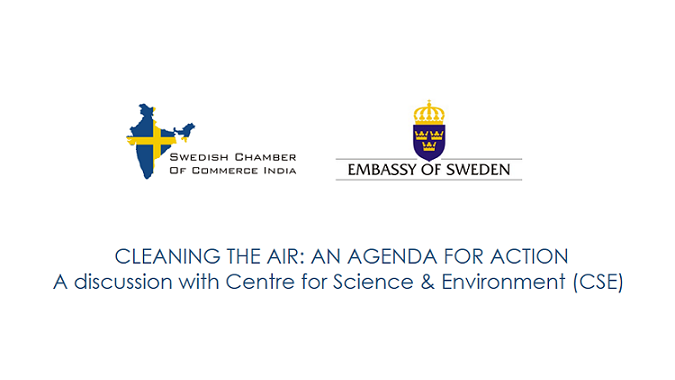 Team Sweden is joining hands with some Swedish companies to get an overall understanding of this grim situation and explore how to contribute and make a difference in improving the air quality in and around Delhi. Ms. Anumita Roychowdhury, Executive Director, Research, and Advocacy from the Centre for Science and Environment will speak on Cleaning the air: an agenda for action and interact with participants to together identify possible areas to work upon for a better future. Join us to begin a conversation on better air quality initiatives.